2. The stand-up paddling season starts in early May again. I am already looking forward to it. It’s such a blast paddling over the lake and enjoying nature. We consider going on a guided river tour next year with two friend of us. Our dream destination is Canada. The nature is just so stunning. On Sunday we’re going to meet our friends for a BBQ and we plan on working our way through the glossy travel brochures. It’s of course a matter of money and skills. We would have to train paddling on rivers here of course. But I would love to go on this adventure! I got this picture from here. Also read this amazing post about stand-up paddling! 3. As I do not really have a lot to do I found out that if I was a minion I would be Phil! Phil is Type A and loves to clean and organize. You are a planner and always take responsibility for what needs to get done. Your friends rely on you to be a leader, a position in which you shine! 4. Last week I attended this conference at work. It was about gender and diversity. It was very enlightening for two reasons! First I learned that apparently I should have suffered from severe discrimination and that I should have barely achieved my degree by the fact that I am a first-time academic! Apparently it is a flaw that my parents never attended university and due to that I had an unsupportive upbringing. And apparently I should feel ashamed about that! SERIOUSLY? I WAS PISSED OFF IMMENSELY BY THIS STUPID SMUG GUY! Second I learned that every women must be emancipated but true emancipation is only achievable if we do exactly what gender specialists say. Yes I belive this is what’s emancipation is really all about: Following the rules of somebody else! DO THOSE PEOPLE NEVER LISTEN TO WHAT THEY SAY????? I’d rather do what I want even if that meant I am being “unemancipated” than following a stupid mainstream and be unhappy! In my books true emancipation means being able to do whatever YOU want! I think that’s really worth achieving! 5. This really really cracked me up! I admire this person from the heart. 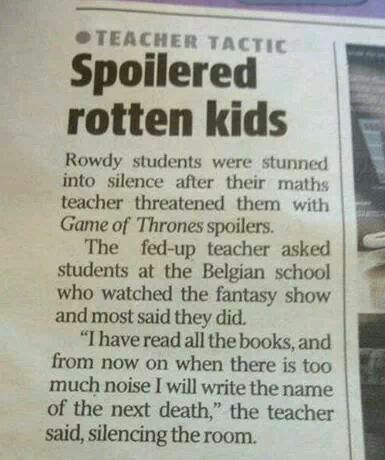 Getting spoilered would be a serious threat for me as well! 6. I’ve bookmarked a few recipes lately and I think I will give Meghan’s Lemon Blueberry Granola a try tomorrow. We ran out of granola a few weeks ago and I was looking for a fresher version of granola for spring. Meghan’s recipe sounds delightful and I can’t wait to give it a try! Oh gosh coffee is everywhere! I have been feeling like I am way over caffeinating so I am trying so hard not to turn mine on right now! Maybe I need to get some decaf to confuse myself haha. I loved what you thought about emancipating yourself! I couldn’t have said it better! I tried decaf but it really doesn’t satisfy me. So I’ll happily embrace that pleasure! I have definitely been on the running myself ragged mentally train as well. I’d start to get those moments where I’d walk into a room with a specific intention and by the time I got there I would completely forget why I was there. All sorts of little things like that. I’m looking forward to spring break at the music school where I’m a teacher next week. A whole week of mentally refreshing and working on things that have nothing to do with my job. Hope you’re having a brilliant week off and find some time to relax and have fun! Having off a day on Thursday really made me feel way better! Thank you for your kind words, Brianna! Ahhh Paddle boarding is SO MUCH FUN! I had a whale come up for air right in front of me when I did it, such an incredible (but scary) rush! That granola looks great! I made a cherry coconut granola last weekend, and it is almost gone so I need another. This would be perfect! Thanks for sharing your randomness! Ohhh I was tempted to make Meg’s granola too but I’m waiting for her chocolate peanut butter one…. One of my good friends is attending many of the diversity meet ups at my work and apparently some of the things said…women putting THEMSELVES down! I like your breakfast….okay your breakfast bowl. In my opinion (and I feel like I’m alone with this mindset sometimes) many women just don’t present themselves really well. Understatement is not a career booster. So if they stopped to behave like an intimidated child they would be treated like the professionals they should be!